Series CBT represents horizontal, single-stage volute casing pumps designed in compliance with ISO2858 / EN22858 pumps high temperature liquids(> 200 ºC) and offer special execution with center line feet upon request. The innovative process design enables full dismantling of bearing unit towards the drive end eliminating the need of disconnecting the pump casing from the piping. Using a spacer coupling also cuts the need of disconnecting the motor. 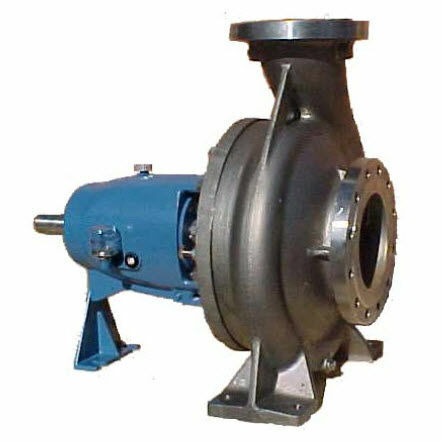 Series CBT volute casing pumps finds wide application which requires pumping of clear or slightly dirty or even corrosive liquids making it highly suitable for use in chemical and petrochemical industries, pharmaceutical industries, plastic and rubber industries, ferrous and non-ferrous metal industries, paper and cellulose industries, textile industries, food and drink industries, thermal power stations, municipal water supply and irrigation. The pumps are designed with up-to 2,200 m³/h flow rate, up-to 160 m head with 3000 rpm max speed to operate at max. 350 °C and up-to 25 bar casing pressure.